I don't recommend searching for Biblio-Curiosa on the net. 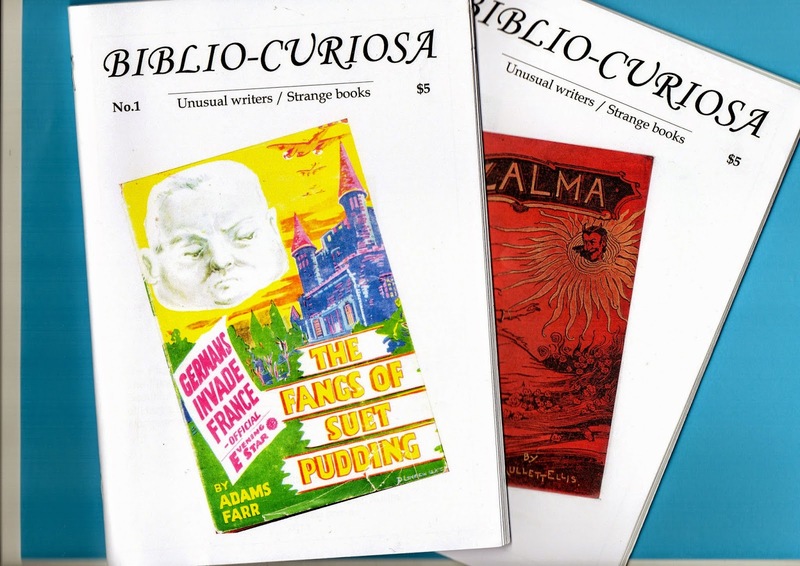 You'll find a lot of sites interested in “unusual writers and strange books”, but a rather different kind of strangeness.. While it is certainly nice to see independent journals pop up with greater frequency as weird/strange fiction attracts a larger readership, it would be even nicer to see an increase in publishers willing to reprint these often elusive books. Print-on-demand and ebook editions are all very well, but editions(even e-editions) with better, thoughtful production values would be so much better. An unfortunate problem I encounter after reading such enjoyable weird fiction journals, Wormwood being the best, is that I simply cannot find copies of some of the tantalizing books discussed. Phyllis Paul comes to mind, especially. After reading so many well-written and mouth-watering articles about her work, I feel as if I know and love it. Sadly, I have only been able to find and read one of her books, and a rather sad reprint at that. I would love to splurge on her first editions, but her books may be some of the most elusive of the twentieth century. If Mark Valentine stands behind the quality and integrity of this new zine, I certainly trust his opinion, but Mr. Mikul should establish a website if he wants to attract more readers. As charmingly old-fashioned as a printed zine one orders via a post office box on the other side of the world or email address may be, an established website lends a greater sense of reliability and permanence. Sounds very interesting but I concur with Anon above. If you want to feed my interest, make the mag. more accessible.